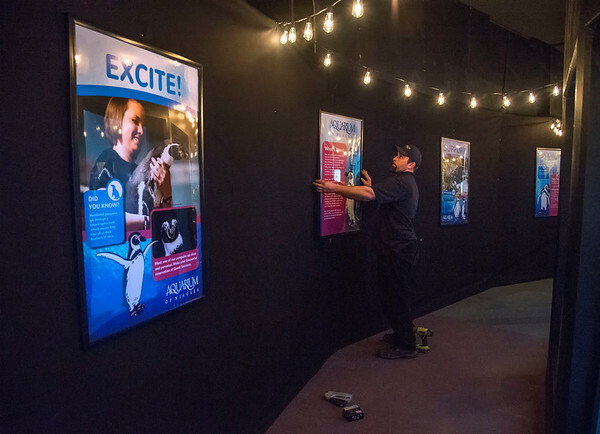 Niagara Falls, NY - Aquarium of Niagara facilities technician Chris Rutkowski of Niagara Falls, hangs promotional posters promoting the future Penguin habitat in advance of the official construction groundbreaking ceremony Friday morning. The 7 Humboldt Penguins are staying in a temporary habitat until the spring of 2018 when officials plan to open the new one. The habitat will be capable of housing a total of 20 penguins, making plenty of room for youngsters under the species survival breeding program to help the threatened Humboldt warm weather penguins, native to the coasts of chili and Peru.